Welcome to the Etruska Apartments! 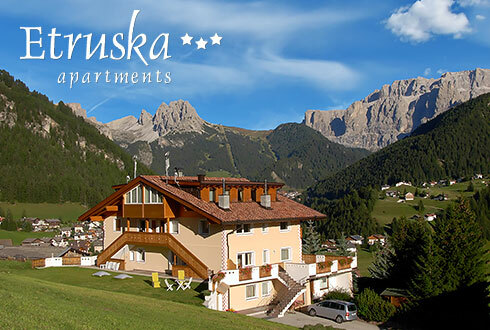 Etruska is placed on the sun side of the town, in a quiet and lovely location. 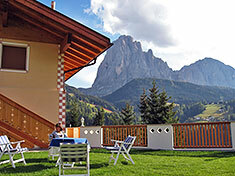 From here you have a wonderful view of the Dolomites and of the town of S. Cristina. Etruska Apartments was completely rebuilt in July 2006. All our apartments were refurnished to offer a maximum comfort atmosphere for a pleasant and relaxing stay. 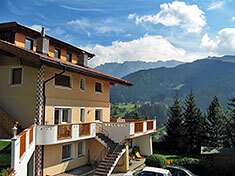 Each apartment is equipped with everything you might need, including its own special view. During the summertime the location is surrounded by a lovely green land and beautiful flowers, it is the ideal spot for taking walks, hikes, or bike tours. 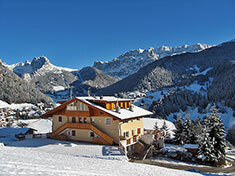 Wintertime is the perfect place for skiing! 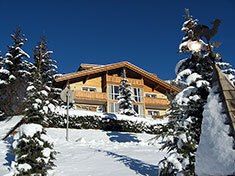 We are located a few minutes walk distance to the bus and shuttle stations to the skiing area.